If you’re a local commercial farmer, residential farmer or backyard grower you can donate a portion of your land to grow produce for Feed Iowa First. Feed Iowa First will provide the plants and will organize volunteers to help plant, maintain and harvest produce. Growers may be eligible for up to $5,000 in tax credits and the retail value of the produce may be tax-deductible. Our only requirement is that the produce is locally-grown, non-GMO and chemical free. Join Feed Iowa First by committing a small percentage of your land to grow produce to help nourish the neediest members of our community. Bluebird Farm dedicates a portion of their commercial farmland to grow produce for Feed Iowa First. Bluebird helps by tilling the land and Feed Iowa First provides the seeds and/or plants and also provides volunteers for field maintenance and harvesting. 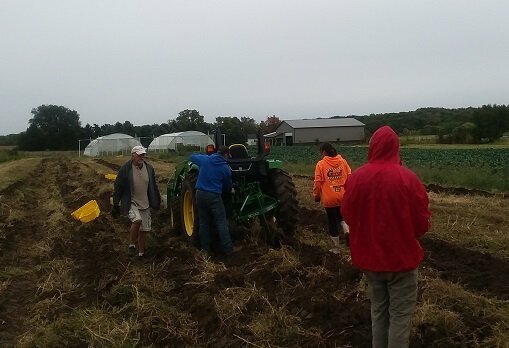 Several dedicated volunteers came out in the rain to help harvest over 1200 pounds of potatoes. Feed Iowa First is so grateful for our partnership with Bluebird. Bluebird Farm, owned and operated by Rogan & Brenna Stoops has been a tireless supporter of Feed Iowa First. Please join our other Grow Some Rows partners and commit a small percentage of your land to grow produce for Feed Iowa First and help the neediest in our community. Lily Acres, a private landowner, donates a portion of their private land to grow produce for Feed Iowa First. in the first year of our partnership in 2018, Lily Acres grew onions. Lily Acres helped with soil preparation and generously donated the onion sets. Feed Iowa First provided volunteers for field maintenance and harvesting. For the 2019 growing season, Lily Acres is growing garlic, which was planted in November 2018. 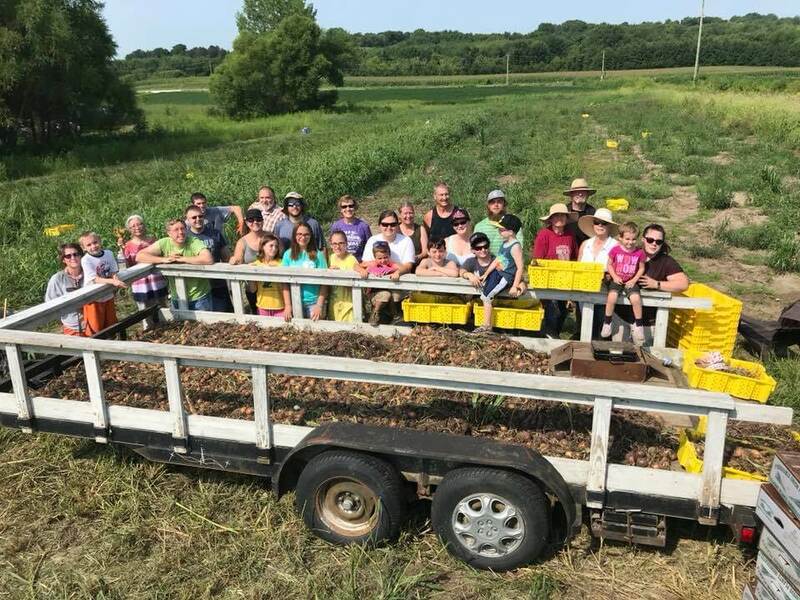 Thirty-two volunteers helped harvest 2006 pounds of onions in two hours in August 2018. 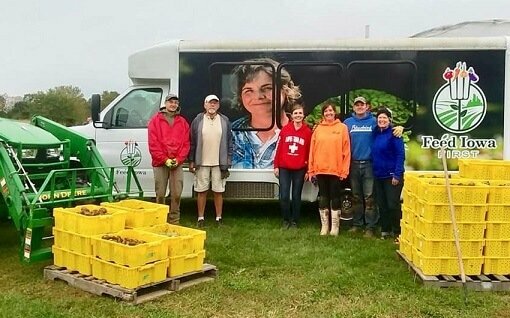 Feed Iowa First is so grateful for our partnership with Lily Acres that yields so much bounty and brings together volunteers that care about food insecurity.